The second-largest living animal after the blue whale. The fin whale's record lenght is about 27 meters. 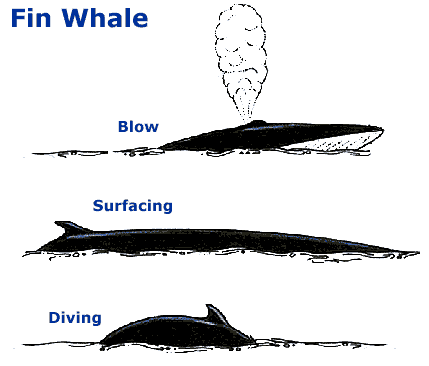 At sea, the fin whale is most likely to be confused with blue and sei whales. All others are much smaller. However, the fin whale has a dramatic asymmetry which whale watchers can easily observe: white on the lower right side of the head; black on the lower left. Sometimes, if the whale is feeding, you can also see the mostly white baleen on the right side, the baleen on the left side is dark grey. 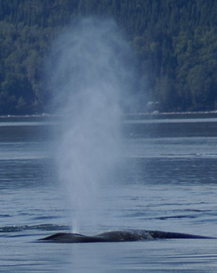 Fin whales rarely breach or spyhop when being observed and normally just keep feeding. 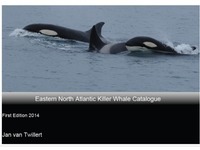 They are often observed alone or in pairs, but on feeding grounds up to 10 or 20 can be found together.